Should I choose Itemized or Standard deduction? I see I am saving more when I choose Itemized deduction, even though its less than standard deduction. Is that normal? And in this case should I choose itemized and disregard recommendation of Turbo Tax? Screenshots below. When I choose Standard Deduction. When I choose Itemized Deduction. 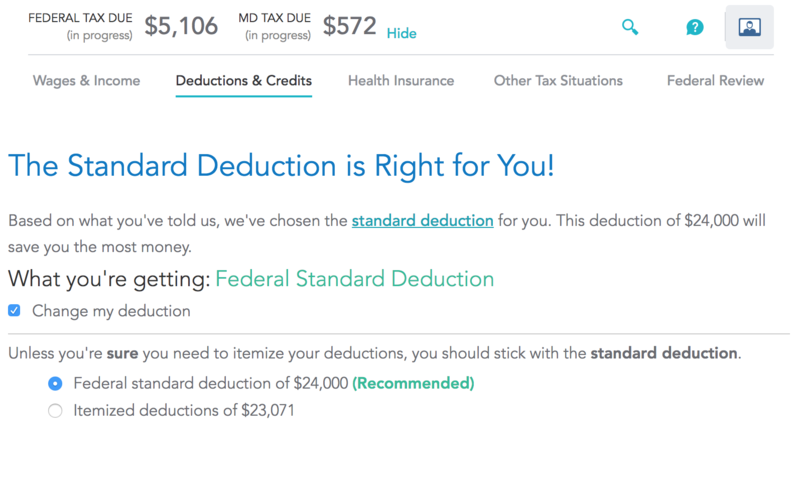 Should I take the standard deduction or itemize? - The federal tax reform of 2017 significantly raised the federal standard deduction. Under current Maryland law, if you take the standard deduction the federal level, you cannot itemize at the Maryland level. You may take the federal standard deduction, while this may reduce your federal tax liability, it may result in an increase to your Maryland income tax liability. The Comptroller’s Office encourages you to run your income tax returns under both deduction methods, and to compare the results of taking the standard deduction versus itemizing yours deductions, to see which method causes the lowest overall tax liability. 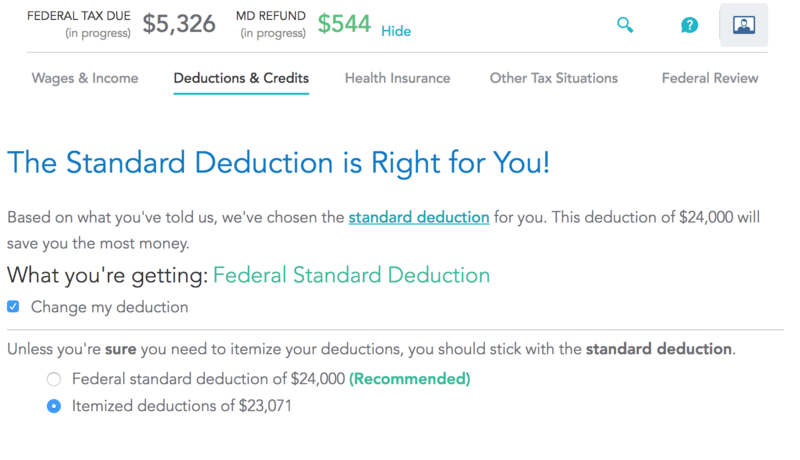 According to Maryland State Law, the Maryland standard deduction is $2,250, and you may not itemize in Maryland if you choose the standard deduction on your federal return. Therefore, choosing to itemize will increase your federal taxable income slightly (and therefore your federal tax burden), but will reduce your Maryland taxable income by potentially up to $20,000. That would explain the significant difference in results you see. Not the answer you're looking for? Browse other questions tagged united-states income-tax tax-deduction turbotax maryland or ask your own question. What types of receipts do I need to keep for itemized tax deductions? Calculating savings from mortgage interest deduction vs. standard deduction? Can I deduct mortgage interest in Kansas with a standard deduction?